These circles exist to support individual circle members in contemplating and discovering their unique life purpose or calling and exploring how they might best offer that spirit gift to support the unfolding of world dream, the alchemical transformation of collective, global Consciousness. The intention of Light Circles is to ignite and bring forth the flame of greatness in individuals, groups, oganizations and nations, for the sake of world peace and planetary abundance. The structure of the groups is non-hierachical and horizontal and the methods involve ritual, symbolic expression, deep listening, authentic sharing, heart knowing, and matrix intuition and intervention. Through creating resonant fields of individual and collective acceptance and empowerment, circle members will inspire one another, sometimes the whole group, to generate and manifest concrete projects for the upliftment of humanity. Circle members will also form other Circles of Light and Empowerment around their own interests and passions and thus produce a ripple effect of ever expanding circles of service and light. In this way, the authentic needs of both the one and the One will be fufilled: what is best for the individual self will also serve the blossoming of the One Self. 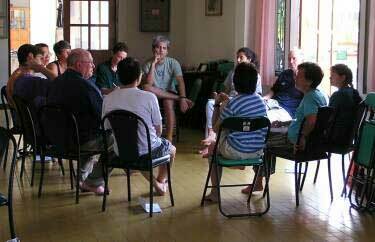 The New York-based ISDnA network, centering on InterSpiritual Dialogue (ISD) and its many friends, host four circles per month. Drawing from about 200 practitioners, notable spiritual traditions that are represented include Christian mysticism, Advaita and other vedantic paths, Tibetan and Pure Land Buddhism, Siddha Yoga, and numerous shamanic practice groups. Currently, there are two Manhattan westside, one Manhattan eastside, and one Brooklyn circles meeting monthly. Three of the sessions are on sharing interspiritually through silence, meditation, and quiet dialogue from the Heart; the fourth circle centers on shamanic experience. The three interspiritual circles are moderated by Dr. Kurt Johnson, a satsang sharer in the tradition of Advaita and a co-founder of ISD; the shamanic circles are hosted by Rev. Dr. Thomas Downes, the current Moderator of ISD�s �Service Council�, and Dorothy Cunha and Lisa Lerner of Oscar Miro-Quesada�s Heart of the Healer Foundation. The New York community is also emphasizing “Focus Groups”. Focus Groups are circles which share a common interest in a certain type of manifestation in both exploration and service. Examples are artists, therapists, health professionals, scientists, and so on. Currently, the New York community has initiated focus group discussion among therapists who are also deeply committed spiritual practitioners and among scientists, particularly ecologists, and women interested in the feminine experience of Awareness. In the New York Advaita Vedanta community the NY Circles are known as the �Lateral Satsang� from the traditional sanskrit word for a gathering (�sangha�) in Truth (�sat�) and represent a wonderful example of where the same circles are serving more than one community. 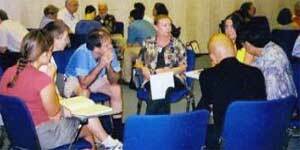 Information and schedules concerning the New York circles and focus groups can be obtained by emailing kurtjohnsonisd@yahoo.com or consulting www.satsangteachers.com.